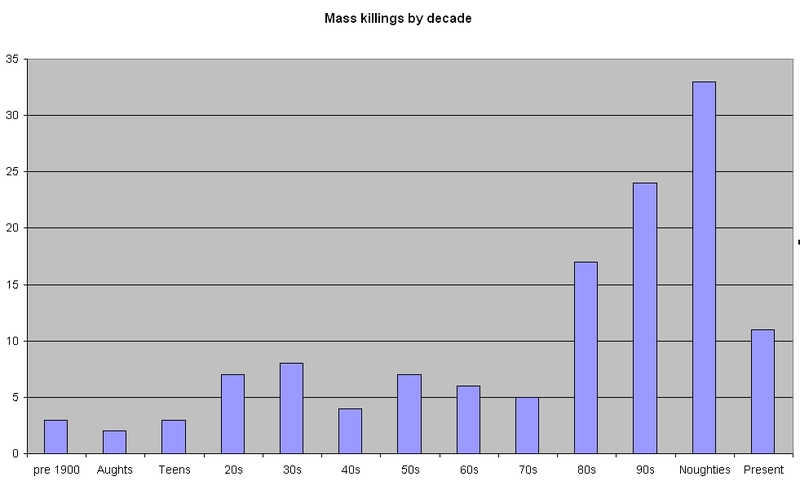 I think I was 11 or 12 when I first became aware of the phenomenon of mass shootings. I was reading a Stephen King short story called 'Cain Rose Up' in which a student shoots people from his dorm window. The story stuck with me because it contained no monsters or supernatural elements. It was based on Charles Whitman’s 1966 shooting spree at the University of Texas at Austin in which the former marine killed 16 and wounded 32. Whitman’s rampage is interesting in that it embodies many of the elements that have since coalesced into an archetypal model for this kind of incident. He was a young man of above average intelligence with a strong sense of order and personal hygiene. He had an abusive family life. He planned his shooting meticulously. He shot indiscriminately from the elevated position of a clock-tower. An autopsy revealed an aggressive brain tumour. He was a white, male American. Mass shootings seem an almost purely American beast in the popular imagination, with just a few examples, Martin Bryant, Anders Breivik, Dunblane, bred from a different stock, but this is only partially true. Of the 550 ‘rampage killings’ listed on Wikipedia (excluding school and workplace shootings), a greater percentage occurred in Oceania and Asia than the Americas. Looking only at the 61 school shootings listed, China leads the pack with 19 incidents to the US’s 16 (Germany punches above its weight with a respectable 8). When the number of deaths is factored in, Chinese students, although good at math, are shown to be inaccurate marksmen. School shootings in the US claim an average of nearly 10 victims per incident, while the Chinese only average 3. Unfortunately the US seems a stressful place to work. Of the 40 workplace shootings listed nearly half occurred in the US (only 2 involved postal workers). Unsurprisingly some military training is an advantage, though not necessary. Access to high powered automatic weaponry is also an advantage (although Africa’s William Unek incredibly killed 57 people in 2 separate rampages, mostly with an axe and a pistol), as is access to explosives. Posing as an authority figure also seems to work quite well. Asia’s worst spree was conducted by Woo Bum-kon who travelled from one village to another killing people while dressed in his police uniform. A secluded spot and some sort of structure to corral people into would also seem to be advantageous. Anders Breivik combined many of these strategies (substituting simulated combat for real by playing video games), and achieved a very high death count. James Eagan Holmes’s recent shooting spree was less successful for omitting some of these strategies. Although having access to explosives, which he used to booby-trap his apartment, he did not incorporate these into his rampage. Additionally he did not block the cinema’s exits and, in choosing a cinema, he selected a location with multiple points of cover and further hampered his visibility by letting off smoke canisters. Shooting sprees in the future. As evidenced by the accompanying graph, shooting sprees are becoming more common. With the wealth of information now on offer in the media we can expect future killers to plan and conduct more lethally effective rampages. In most instances easy access to weaponry is a requirement. 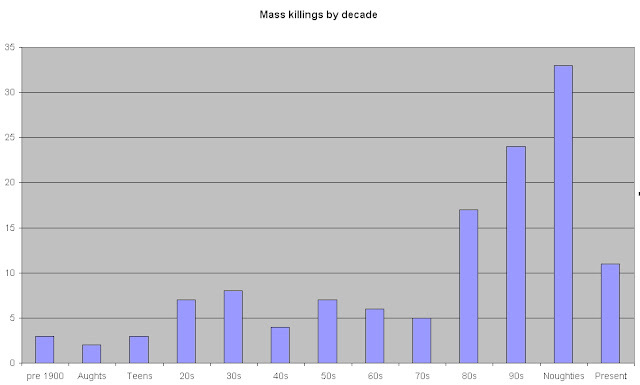 Without some change to make obtaining such weaponry more difficult, mass killings in the US will continue. Sadly, with 12,632 gun related homicides in 2007, any single shooting spree, while horrifying, will effectively always be nothing but background noise to the larger slaughter.